The upstate New York area near Buffalo and Niagara Falls, NY is quite beautiful through most of the year. However, like many scenic areas of the U.S., the Buffalo, NY area is prone to severe weather that can have a devastating effect on homes and property. Located between Lake Erie and Lake Ontario, this area experiences lake-effect snow and breezes that affect the weather year round. Residents in Buffalo and Niagara Falls, NY should always prepare for the possibility of strong winds and severe weather and during the winter, the possibility of heavy snow. The Niagara Falls and Buffalo weather can have damaging effects on your property. Fortunately, there are disaster restoration professionals who provide water damage, storm damage, and other restoration services in the Buffalo and Niagara Falls area. If you experience this type of damage in your home or business, you must call a disaster restoration professional immediately. Flood damage will gradually get worse once it starts and the damage from a storm requires quick attention to protect the structural integrity of your home. By being mindful of the weather and reacting quickly, you can keep your home and property protected through the toughest Buffalo and Niagara Falls weather. Buffalo, NY is located on the eastern shore of Lake Erie. The Niagara River starts in Buffalo and flows through Niagara Falls up into Lake Ontario. This close proximity to the lake has a yearlong effect on Buffalo weather. The humid continental climate of the Buffalo, NY area is typical in the Great Lakes region and has very short transitional seasons between summer and winter. The lake effect might result in more snow in Buffalo, but it also keeps the temperatures cool in the summer. Buffalo summers experience sunshine and moderate humidity, and the lake effect breezes prevent the temperatures from rising above 90 degrees. The summer is quite dry as well as the lake effect breezes prevent thunderstorms from forming. In August, the lake effect becomes weaker which leads to more rain, humidity, and higher temperatures. The rain late in the season has the potential to cause water or flood damage in homes and buildings. In these cases, you must call a water damage restoration professional to stop the spread of the water. 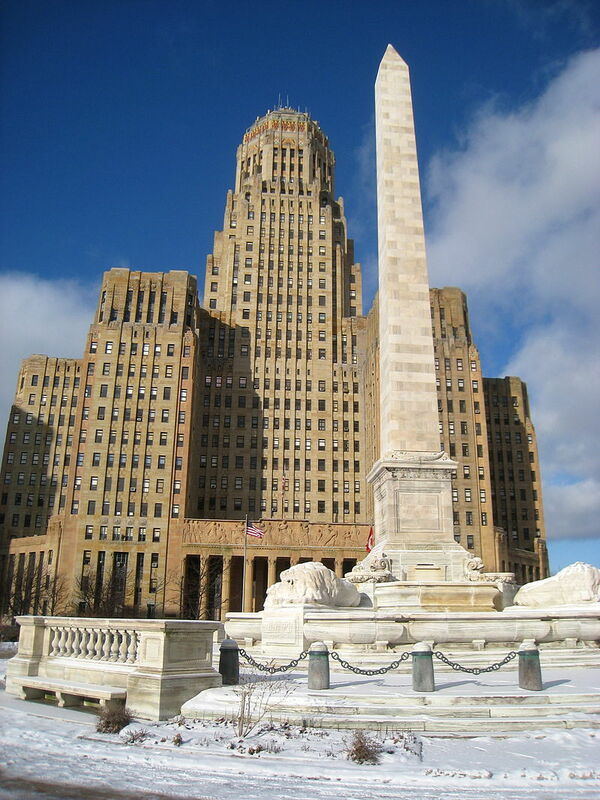 Buffalo is most known for its long, snowy winters as nearly all of upstate New York experiences heavy snow. However, it does not snow as much in Buffalo as in the upstate New York cities of Rochester and Syracuse. Still, Buffalo has averaged over 100 inches of snow per year from 2013-2015 which has caused it to finish second for New York state’s Golden Snowball Award. This amount of snow was second only to Syracuse. 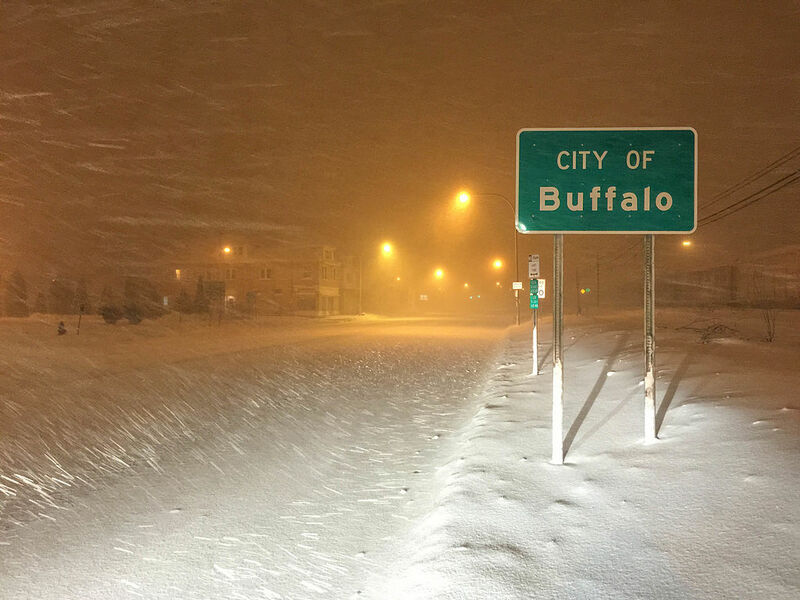 Blizzard in Buffalo caused by lake effect snow. The snow may hit Buffalo early in the season as the area has experienced big snowfalls in October and November. While the city is usually well prepared to handle snowfall, the snow can still cause significant property damage. The weight of accumulated snow can cause structural damage to the roof of a home or building and the winds of a blizzard can also result in damage. You must call a local professional for storm damage restoration if your home or business experiences damage in a blizzard. These professionals will work quickly to stabilize and restore your property in the middle of winter. Niagara Falls, NY is located between Lake Erie and Lake Ontario along the Niagara River which flows over Niagara Falls. The climate of Niagara Falls is similar to that of Buffalo as each city experiences essentially two seasons. However, Niagara Falls experiences more extreme temperatures in the summer and winter as well as consistent precipitation. View of Niagara Falls, NY from Niagara Falls Ontario. Like the other cities of upstate New York, the annual snowfall in Niagara Falls is above the national average but below the average of nearby cities such as Buffalo, Syracuse, and Rochester. The average lows during the winter in Niagara Falls are approximately 3 degrees lower than that of Buffalo and it averages around 18 less inches of snowfall per year. It is common for a thaw cycle of temperatures above freezing to follow snowfall in Niagara Falls. Niagara Falls also experiences about as much rain as it does snow in the winter. The low temperatures during the Niagara Falls winter can lead to a source of in-home flooding that many homeowners rarely think about, burst pipes. Freezing temperatures freeze the water in poorly heated or insulated pipes. As the frozen water within the pipe expands, it will eventually cause the pipe to burst. This allows water running through the pipes to spill out into the home and cause considerable damage. Professional water damage restoration technicians can fix the pipe and remove the spilled water, even in the middle of winter. Ignoring a burst pipe in the middle of a Niagara Falls winter can quickly lead to more serious issues. The summers in Niagara Falls experience slightly more extreme conditions and higher temperatures than those of Buffalo, NY. The lake effect in Niagara Falls is not as strong to keep the temperatures moderate or prevent significant rain. 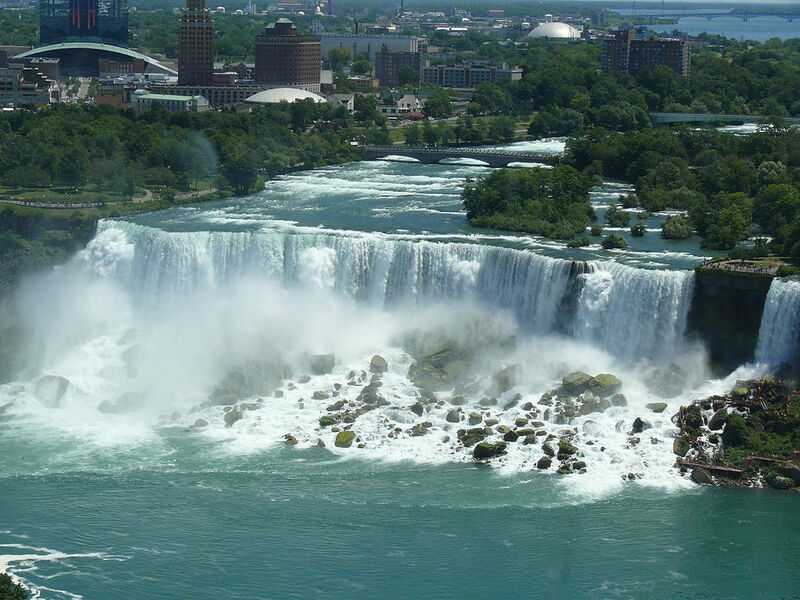 The average precipitation in Niagara Falls is similar to that of Buffalo. However, about 38 percent of the summer precipitation comes from thunderstorms. This makes Niagara Falls more likely to experience severe weather in the first half of the summer. Upstate New York has experienced flooding, severe storms, and tornadoes that have caused significant damage to homes and property. If your home or business sustains damage in a storm, a professional must restore and rebuild it right away. Intense structural damage will only worsen and threaten the integrity of your home. The professionals that provide storm damage restoration services in the Niagara Falls area will quickly stabilize your home and rebuild it to its previous condition. Upstate New York contains much natural beauty including wildlife refuges, the Great Lakes, and Niagara Falls, but the weather conditions can sometimes be menacing. From the potential for heavy snowfall to severe summer storms, local residents in Buffalo and Niagara Falls, NY should be prepared and ready to call a local disaster restoration professional if necessary. Knowing that you have protection from the worst weather can help you enjoy the true natural beauty of the Niagara Falls and Buffalo, NY area.